One thing I really love about makeup is the amazing items I can find at the drugstore. While I do not discriminate towards any type of makeup, y’all know I am always on a mission to find amazing drugstore makeup. Who doesn’t love finding cheap things that are amazing?! The best drugstore foundation is one of those items. So, let’s talk foundations… specifically, full coverage drugstore foundation. Ooooooh. Aaaaaaaah. Some of you may like a natural or dewy finish to your foundations, but this post is for the ladies who want full coverage! We’re saying YOLO right now. We all have those nights we want to go full glam, or maybe you’re having a particularly frustrating breakout you need to cover. 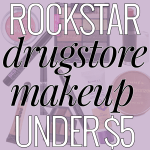 The drugstore is full of amazing options for full coverage foundations. Here are 8 drugstore foundations totally worth buying! Now that you’ve got that, let’s get down to business with the best drugstore foundations. Revlon Colorstay Liquid Foundation // If you’ve been around for 3+ years, you know that this is one of my all-time favorite foundations. I’ve strayed away, but when I come back, I always remember why I love it so much. It’s a thin, liquidy consistency but builds to full coverage and stays put pretty much forever and a day. I cannot say enough good things about it! Revlon Colorstay Whipped Creme Makeup // This is very similar to the liquid version, but a whipped consistency. I actually feel like this is thicker and gives a more powdery finish. I really like it when I want to have extremely high coverage that is very matte. This is becoming harder to find in stores, and I hear that they may be discontinuing it… but I’m not sure, so… here’s a bonus. (bonus) Maybelline Fit Me Matte + Poreless // This foundation has a gorgeous finish while also being full coverage. It quickly rose as one of my favorite foundations ever! Cover Girl Outlast Stay Fabulous 3-in-1 Foundation // This is a gorgeous full coverage drugstore foundation. Probably my second favorite of the bunch! It feels more of a natural, creamy formula, and settles very naturally. It can also be worn medium to full coverage and lasts all day. This is great for all skin types. Rimmel Stay Matte Foundation This is a very thick and creamy foundation that settles into a matte finish. I would definitely recommend this for more oily skin types as it is very mattifying. Best of all, this is the cheapest option of the bunch. 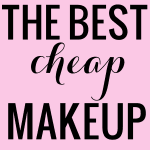 Great for the ladies who are on a budget or perhaps a teenager who is new to makeup. L’Oreal Infallible Pro Matte 24-HR Foundation This is the only foundation on this list that I don’t own, but I had to mention it because I kept reading reviews and seeing a bunch of YouTubers talk about it. My friend Michelle owns the foundation and she told me that it’s creamy, easy to blend, and dries to a super matte finish. She told me that it lasts very long and is great for oily skin. Rimmel Lasting Finish 25 HR Foundation This drugstore foundation is very natural and creamy, but does give great coverage when you build it up and lasts quite a while. Maybe not as long as some of the others, but I really love the finish. This is another inexpensive option, probably better for those with normal skin types or older women. Maybelline SuperStay Better Skin Foundation This is a gorgeous drugstore foundation that I find to be very similar to the Cover Girl foundation I talked about above. It starts out as medium coverage and can build very easily to full coverage. It looks amazing on the skin! NYX Stay Matte but not Flat Powder Foundation Of course I had to include a powder foundation option! I find this powder to be extremely similar to the MAC Studio Fix powder. When applied with a dense kabuki brush, it gives quite a bit of coverage. I also feel like it stays put pretty well. And there you have it! A full coverage glam face fo’ cheap. Let me know your best drugstore foundation! Be sure to check out the Beauty Section before you go. I really struggle with finding a foundation that works for me. It always looks so fake (and trust me, I’ve tried all sorts of shades). Plus it’s so thick looking. I usually use a tinted moisturizer but I know foundation would be better (especially in photographs). Maybe I’ll try again and take one of your recommendations into consideration. Thank you for this! I have been wanting to try out a new foundation and this is perfect! I rarely use full coverage foundation, but I’m thinking I should try it because your makeup always looks so dang good. Maybe that’s the part I’m missing. 😉 Thanks for putting this together! I recently cheaped out (i usually use bare minerals) and bought the revlon airbrush foundation… and I am not really a fan. I keep using it because I bought it, but definitely going to get the colorstay again next time. I was definitely a fan of that last time I had it (thanks to you!). I love BB creams in the summer, but in the winter I feel like I need a little more coverage. I love these. I can’t wait to try the loreal pro matte, have heard good reviews. I am going to be 64 & 4 years ago my rosacea ( which I have had for years) absolutely exploded. I have gone to a dermatologist for years & nothing seems to cover up the terrible acne I am experiencing. Sometimes I will not even go out to get groceries. Do you have any recommendations for a concealer & a foundation that covers well without looking like a mask? What foundation would you recommend for a mature skin, that is on the dry side. At present I use Boots No 7 Lift & Luminate Triple Action Serum Foundation SPF15. Have you tried the No7 range? to compare with the ones you have mentioned. Would be interested to hear your personal opinion.